NOAA's Dave Weller and Lisa Ballance count whales south of Carmel at Granite Canyon. The blow of a gray whale as seen on the infrared camera. About ten miles south of Carmel, Dave Weller and Lisa Ballance sit looking intently out at the ocean. There’s not a cloud in sight. They’re in a small trailer parked on the edge of a cliff at a National Oceanic and Atmospheric Administration (NOAA) lab. Both hold binoculars up to their eyes amd call out the coordinates of where they spot a gray whale. Since 1967, this count has happened every other year. While the eastern pacific gray whale is no longer an endangered species, keeping track of its population level is required under the Marine Mammal Protection Act. So for seven weeks, five days a week, nine hours a day, researchers take their turn in these seats. Weller is pointing to infrared surveillance cameras mounted on the hillside that spot the whales by their body temperature and their blows. “There’s three cameras. One looks to the south, one looks to the center, one looks to the north,” says Weller. This is not the first time this type of technology has been used in the count. In previous years, Weller worked with some hand-me down cameras from the military. 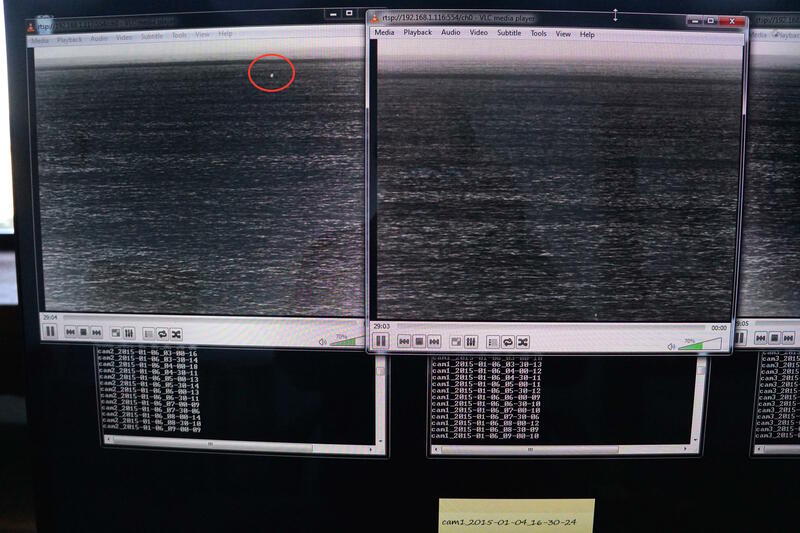 But the picture was fuzzy and researchers had to go through the hours of video in real time to look for the whales. With this new system the picture is clearer, and the computer backing up these cameras does a lot of work. “The software identifies every blow that a gray whale sends off in the field of view. It detects it and it records that,” says Weller. Then the researchers can just review the video where the camera says it detected a whale meaning they can go through 24 hours of video in about 20 minutes. And that has opened the door to dramatically expanding this whale count. The cameras observe 24 hours a day and started running at the beginning of December and will continue every day until June. So for the first time instead of just capturing the peak of migration, Weller and his team will be able to count the whales as they travel south to Baja California where they mate and give birth, and see the same whales head back north up to the Artic where they feed. “I think that it comes down to increasing our level of certainty in these abundance estimates,” says Steve Stone with NOAA’s Fisheries Service where these numbers help in management decisions. For example, right now they’re reviewing a request by the Makah Tribe in Washington state to re-start its traditional gray whale hunt. So one calculation that comes into play. how many whales can be lost without hurting the population? “For gray whales, that calculation is currently about 600 animals out of those 20,000 could be taken in a given a year, which is far more than is actually taken right now. That’s more llike 130 gray whales per year that are removed from that stock,” says Stone. Gray whales are killed for a variety of reasons. Stone says most are at the hands of aboriginal hunters in the Russian Artic in a hunt authorized by the International Whaling Commission. Then there are accidents like when a whale gets caught in a fishing net or is struck by a ship. And that’s where the new technology helping out in the count also could one day play a role. “So if we can implement a system like this on large ships that sometimes run into and hit large whales, it might be able to provide mitigation strategy in order to reduce ship strikes. And so that’s one application we’re hopeful in which this same technology can be used in the future,” says Weller. For now the system will just be used to enhance this count, and there’s no plan to stop the visual work done by humans.